Oscars 2011 Discussion: Best. Reality Show. Ever. I'm a bonafide cinephille who's been watching the Academy Awards since the tender age of six, and more than twenty Oscar ceremonies later, I can say with confidence that I've seen a lot of the good, bad, and ugly that can be the Academy Award telecast. However, I must confess that last night's 83rd Academy Awards set a new precedent that I was not prepared for: Oscars: The Reality Show Version. It was like I had inadvertently switched on my TV to a special prime time addition of VH1's The Surreal Life. A group of celebrities (old and new) gathered under one roof to suffer through some spectacularly awkward (at times demeaning) situations, creating an atmosphere of wide-eyed "Did that just happen?" fascination that keeps reality show fans tuning into their favorite guilty pleasures. Of course awards shows, by their very nature, are in part reality show - in some ways, the only difference between The Oscars and a show like Survivor is that they don't play dramatic music and cut to commercials right before presenters read the names of the winners. Try to compare some other award shows to reality shows (MTV, looking at you), and the distinction becomes even less clear. Things started off well enough for the 83rd Academy Awards: hosts James Franco and Anne Hathaway opened the ceremony with nice pre-taped skit where they spoofed scenes from this year's list of Best Picture nominees. It was a cute skit, worthy of a few chuckles - sure, it was a move lifted right from the MTV Movie Awards, but as Hathaway herself would later joke, appealing to the younger demographic was pretty much the reason she and Franco were up there. But I don't think even she knew just how "MTV" the rest of the awards ceremony was going to get. As I stated in one tweet during the telecast: It was though the producers had made a conscious decision to present this year's Oscars in reality show format - I guess for the purpose of shock entertainment (now the premiere form of entertainment ruling the airwaves). That's pretty much the only way I can explain many of the decisions that were made upstairs in the control room at various times throughout the show. So unless that reality show atmosphere was the intention, then James Franco isn't the only person who shouldn't be invited back behind the curtain of the Oscars; the director of the show and some of the editors should be lined up for the guillotine, too. Just saying. James Franco looking perpetually intoxicated and/or like he wanted to be anywhere BUT on that stage. All we needed was moment of Franco breaking down and crying that he "Wanted to leave the house and get away from these crazy people," and you could easily have been watching any season of the The Real World. And, like those reality "stars," by the end of the ceremony I was left wondering if Franco truly was that much of a hot mess, or perhaps a wily performer who has mastered the contrivances of television entertainment. Between the amount of Tweeting and video shooting done by James Franco backstage (and at one point onstage), dude was practically making his own reality show while he was hosting. Kirk Douglas being allotted a seemingly infinite amount of time to prove he is a horny young scamp trapped in the body of a half-melted old man. Seriously, somebody sign that guy up for the next season of The Surreal Life before it's too late. 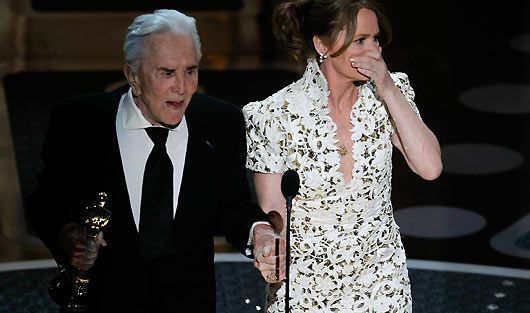 Melissa Leo's profanity-laced acceptance speech rant. I swear, some of what Leo said in that speech was lifted straight out of Snooki's mouth on Jersey Shore. I think it was the part they bleeped out. Randy Newman clearly is a diva befitting any season or incarnation of Real Housewives. Accepting the Academy's favor while showing them little love would also qualify him to be one of Hugh Hefner's girlfriends on Girls Next Door. After losing to Tom Hooper in the Best Director category, I seriously thought Black Swan director Darren Aronofsky was going to deliver our Bad Girls Club fight moment of the night - that's how tightly-wound and twitchy he looked. Franco in drag - I dare you to tell me that WTF moment didn't resemble some reality show challenge. Dare you. Left to carry the weight of hosting on her small shoulders, Anne Hathaway proved why she'd be the perfect contestant for the adult version of Toddlers and Tiaras. The part where she was (jokingly) berated by her mother pretty much cements that comparison. By the end of the night, James Franco had the same look on his face that Simon Cowell did after nearly a decade of sitting at the American Idol judges table, and Anne Hathaway was well into Paula Abdul territory - though, perhaps without the, er, "medical assistance." If the hosts had voted off that group of singing kids who closed the ceremony, our reality show circle would've been complete. Considering that the 2011 Oscars went off in true reality show fashion, it's a real shame that The Social Network didn't win Best Picture. It would've been much more symbolic. A sign of our times.